In this article, we describe the clinical implementation of patient-specific PTV design using 4DCT scanning. We report the initial results on 4D target volume designs and comparison with conventional PTV volume and we also studied dose to surrounding critical structure for different PTVs. Ten patients were immobilized with a vacuum bag in the supine position, with arms raised during simulation. The 4DCT scanning was performed during free breathing on a 16-slice PET/CT (GEMedical Systems, Waukesha, WI, USA). A plastic box with a pair of reflective markers was placed on the patient's anterior abdominal surface, approximately midway between the xiphoid and the umbilicus. Markers' motion was captured by an infrared camera and the respiratory signal was recorded in synchronization with the X-ray ''ON'' signal from the CT scanner. Real-time positioning management (RPM, Varian; Palo Alto, CA, USA) was used for recording the breathing curve. The scanner was operated in an axial cine mode and continuous scans were performed at each couch position, with an interval equal to the patient's average respiratory period so that complete data were acquired over an average respiratory cycle. Data acquisition was repeated at each couch position until full longitudinal coverage of the region of interest was obtained. Parameters for CT acquisition were 120 kV, 300-400 mA and slice thickness of 2.5 mm. The whole scanning time was 90-120 s. Typically, a total of 1200-1500 slices were acquired for each patient. After 4DCT scanning, the 4D software (Advantage 4D, GEMedical Systems, Waukesha, WI, USA) used all reconstructed images along with the respiratory phases that were calculated by the RPM system. Images were sorted into 10 phases based on the temporal correlation between surface motion and data acquisition with an Advantage Workstation. 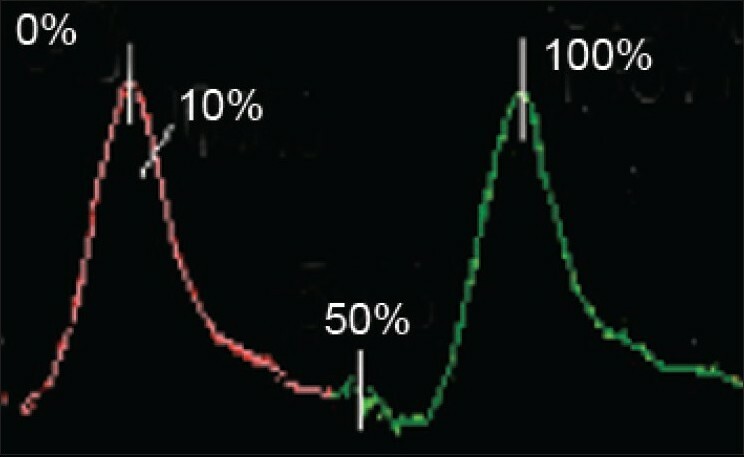 The 10 respiratory phases were evenly distributed over a breathing cycle labeled as CT0%, CT10%, CT20% . . . CT90%. CT0% corresponds to end-inhalation, CT20% to mid-exhalation and CT50% to end-exhalation, as shown in [Figure 1]. GTVs were manually contoured on all 10 phases of the 4DCT scan. Target volumes were defined as GTV, which represented the primary lesion visualized on the CT images. The combined volume of the GTVs in the multiple CT phases was called as GTV4D. GTV4D plus an isotropic margin of 1.0 cm was called as CTV4D. Two sets of PTV4D were derived from the CTV4D, i.e. PTV4D 2cm with a conventional margin of 2 cm (CTV4D plus 1 cm SM and 1 cm IM) and PTV4D 1.5cm (CTV4D plus 1 cm SM and 0.5 cm IM), with reduction in the IM margin. For PTV gated , only three respiratory phases were selected in which organs at risk are at maximum distance from the tumor. PTV gated was generated with a total margin of 1.5 cm. PTV3D was derived from a CTV3D of the helical fast CT scan with conventional margins of 2 cm. All volumes of PTV, i.e. PTV4D 2cm, PTV4D 1.5cm , PTV gated and PTV3D were compared. To quantify the extent of the motion, we selected the two phases where the tumor exhibited the greatest range of motion, i.e. full inspiration (0%) and full expiration (50%) phases. We studied overlapping of PTV3D and PTV4D 1.5cm using the Boolean operator OR. To study the effect of PTV volumes on dose to critical structure, a set of three plans were generated for every patient with three different PTV volumes, i.e. PTV3D, PTV4D 1.5cm and PTV gated . For each set of plans, an identical number of beams, gantry angle and dose prescription were used. For Ca lung patients, lung mean dose and V20 dose were calculated and for abdominal tumors, mean dose of the kidney and liver were calculated. Evaluation of target volumes reveals that 4DCTV is larger than 3DCTV in all patients. This indicates that tumors are mobile. To estimate the extent of tumor mobility, the ratio of CTV3D and CTV4D was calculated for each patient. 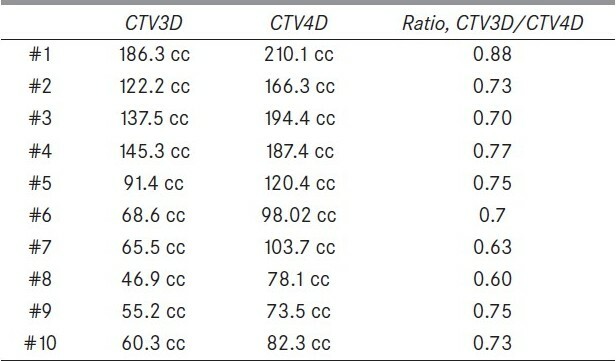 The average of ratio of CTV3D volume and CTV4D volume of all patients was found to be 0.72, with an SD of 0.07 [Table 1]. This ratio for completely immobile tumor is assumed to be 1.00. [Table 2] represents volume PTV3D, PTV gated and PTV4D with different margin. The PTV4D 1.5cm was smaller than PTV3D. PTV4D 1.5cm shows reduction by an average value of 14%. Similarly, PTV gating shows reduction by an average value of 21% of PTV3D. [Table 3] shows the observed tumor motion. The motion of tumor in peak to peak amplitude was found with a variation of 0.2 cm (min) and 1.2 cm (max). In Ca lung patients, the tumor motion during breathing was found to be varying widely in all directions (first five patients in [Table 3]), but for abdominal cancer patients, tumor motion was dominant in the superior to inferior (SI) direction only (last five patients in [Table 3]). To determine the impact of motion on position of PTVs, overlapping of PTV4D 1.5cm and PTV3D was studied. It was noticed that in only one patient, PTV4D 1.5cm was completely overlapped by PTV3D, as shown in [Table 2]. Because a 2 cm margin was used for CTV3D to get PTV3D and a 1.5 cm margin was used for CTV4D to get PTV4D 1.5cm , PTV4D 1.5cm should be completely overlapped by PTV3D. We observed that the nonoverlapping region had a direct relationship with motion of tumor. As shown in [Figure 2], abdomen tumor PTVs were not completely overlapped in the SI direction because tumor motion was in the same direction, i.e. in the SI direction. As tumor motion was very complex in lung patients, nonoverlapping of PTVs was also in a different direction. Nonoverlapping of PTVs was patient specific. This clearly indicates that the nonpatient's specific margin of 2 cm to CTV is also not sufficient if we do not know the tumor motion. [Table 4] shows dose to critical structures. Among the three PTVs plan (PTV3D, PTV4D, PTV gated ), the PTV gated plan has the least lung mean dose and lung V20dose. For the PTV gated plan, V20 lung dose and lung mean dose was lesser than PTV3D by 24% and 25%, respectively. Similarly, for the PTV4D 1.5cm plan, the lung V20 dose and lung mean dose were smaller than the PTV3D plan by 9.87% and 13.2%. The same pattern of dose reduction was also observed for abdominal tumors. Mean dose for kidney and liver were listed for the PTV gated plan. Mean kidney dose reduction of 12% for the PTV gated plan and 16% for PTV4D 1.5cm as compared with the PTV3D plan were observed. Dose reduction is mainly due to the overlapping of PTVs and organ at risk. PTV gated has the smallest volume among the three PTVs and it has less overlapping with organ at risk. This has resulted in reduction in dose to the critical structures. A review of the respiratory motion literature leads to the following conclusion. There are no general patterns of respiratory behavior that can be assumed for a particular patient prior to observation and treatment. The individual characteristics of breathing, like quiet versus deep, chest versus abdominal, healthy versus compromised, etc., and many motion variations associated with tumor location and pathology lead to distinct individual patterns in displacement, direction and phase of tumor motion. Therefore, it is important to know the exact tumor motion to account for IM. Generalized IM increases the probability of not missing target and treating extra normal tissue. The PTV must account for all interfractional as well as intrafractional variations throughout a treatment course. It is not advisable to reduce the margins significantly. A careful approach to planning should be taken. Several sources of errors potentially remain, including (1) residual imaging artifacts, (2) setup variations, (3) delineation variations, (4) interfractional means tumor position variations and (5) treatment-induced changes in target size and motion patterns. The 4D target design eliminates systematic errors in CT imaging introduced by imaging a nonrepresentative target position during a standard helical scan. We have characterized tumor motion using 4DCT and found various tumor motion trajectories. This variability suggests that the use of 4DCT can improve the definition of the treatment target. Assuming an accurate internal motion on 4DCT images, IMs could be reduced from 1.0 cm to 0.5 cm. This will result in reduction of PTV volume and reduced chance of missing target and dose to critical structures. With proper knowledge of trajectory of tumor motion, respiratory-gated treatment can reduce the irradiated volume and can spare more normal structures. 1. Balter JM, Ten Haken RK, Lawrence TS, Lam KL, Robertson JM. Uncertainties inCT-based radiation therapy treatment planning associated with patient breathing. Int J Radiat Oncol Biol Phys 1996;36:167-74. 2. Bussels B, Goethals L, Feron M, Bielen D, Dymarkowski S, Suetens P, et al. Respiration-induced movement of the upper abdominal organs: A pitfall for the three-dimensional conformal radiation treatment of pancreatic cancer. Radiother Oncol 2003;68:69-74. 3. International Commission on Radiation Units and Measurements. Prescribing, recording and reporting photon beam therapy. Supplement to report 50. Report 62. Washington, DC: ICRU; 1999. 5. Sixel KE, Ruschin M, Tirona R, Cheung PC. Digital fluoroscopy to quantify lung tumor motion: Potential for patient-specific planning target volumes. Int J Radiat Oncol Biol Phys 2003;57:717-23. 6. Yamada K, Soejima T, Yoden E, Maruta T, Okayama T, Sugimura K. Improvement of three-dimensional treatment planning models of small lung targets using high-speed multi-slice computed tomographic imaging. Int J Radiat Oncol Biol Phys 2002;54:1210-6. 7. de Koste JR, Lagerwaard FJ, de Boer HC, Nijssen-Visser MR, Senan S. Are multiple CT scans required for planning curative radiotherapy in lung tumors of the lower lobe? Int J Radiat Oncol Biol Phys 2003;55:1394-9. 8. Mageras GS, Yorke E. Deep inspiration breath hold and respiratory gating strategies for reducing organ motion in radiation treatment. Semin Radiat Oncol 2004;14:65-75. 9. Lagerwaard FJ, Van Sornsen de Koste JR, Nijssen-Visser MR, Schuchhard-Schipper RH, Oei SS, Munne A, et al. Multiple "slow" CT scans for incorporating lung tumor mobility in radiotherapy planning. Int J Radiat Oncol Biol Phys 2001;51:9327. 10. Shih HA, Jiang SB, Aljarrah KM, Doppke KP, Choi NC. Internal target volume determined with expansion margins beyond composite gross tumor volume in three-dimensional conformal radiotherapy for lung cancer. Int J Radiat Oncol Biol Phys 2004;60:613-22. 11. Underberg RW, Lagerwaard FJ, Slotman BJ, Cuijpers JP, Senan S. Benifit of respiration-gated steriotactic radiotherapy for stage I lung cancer: An analysis of 4DCT datasets. Int J Radiat Oncol Biol Phys 2005;62:554-60. 12. Keall PJ, Mageras GS, Balter JM, Emery RS, Forster KM, Jiang SB, et al. The management of respiratory motion in radiation oncology report of AAPM Task Group 76. Med Phys 2006;33:3874-900. 13. Rietzel E, Liu AK, Doppke KP, Wolfgang JA, Chen AB, Chen GT, et al. Design of 4D treatment target volumes. Int J Radiat Oncol Biol Phys 2006;66:287-95. 14. Murphy MJ, Balter J, Balter S, BenComo JA Jr, Das IJ, Jiang SB, et al. The management of imagining dose during image-guided radiotherapy: Report of AAPM Task Group 75. Med Phys 2007;34:4041-63.